My husband, Mike and I (Linda) have owned and managed this property along with Sonya and Brock Garrett for many years. We have 3 daughters, 3 sons-in-laws and 7 grandkids. Our middle daughter, Julie met her husband while at the condo. We take great pride in this unit and do everything in our power to see that you have a great trip. We did an extensive renovation last year and feel that anyone would love vacationing there. We have 4 decks looking out to the beach. 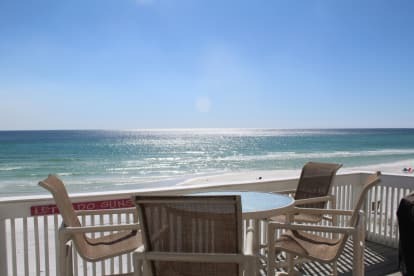 There is a small cozy deck off the master bedroom, a large deck off the living room with grill, a large covered deck of the ocean side bedroom on the lowest level and a large beach deck that has chairs and a whole lot of toys for you to play with.